The Order of the Glazed Cruller. I wonder if other private firm’s (Blackwater?) employees got medals. A major overhaul of how the Canadian Forces recognizes overseas service will include the controversial decision to allow Tim Hortons employees at Kandahar Airfield to receive medals from the Afghan war. The decision, which has raised eyebrows in the military community, echoes similar methods of recognition applied during the Second World War, according to the Department of Defence. 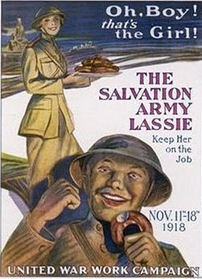 Medals were awarded during the Second World War to civilians working for Salvation Army, Knights of Columbus, the Canadian Legion and the YMCA. Isn’t this kind of like in some schools where you get a gold star or whatever for showing up? Can’t be hurting anyone’s feelings by leaving them out. You signed up, did the required time, and got your lucky packet feel good medal. On behalf of all Canadians, I apologize for this nonsense. I got in trouble once for “not being in uniform” when it was noticed I wasn’t wearing any campaign ribbons. If you “pass thru” Korea, you get a campaign ribbon for that war===don’t even have to sell a donut. That one and two others were missing. It was hard to be alive and not have at least 10 medals. Without the donuts you can’t get a Canadian general anywhere near Afghanistan. at one point you could Fly and drop in almost any area, for even a moment..and get a Medal. First of all you have to be a nitwit to attach some form of honour to a strip of metal worn on clothing. Then you have to be more of a dunce to think that having a strip of metal pinned on you somehow makes up for being in a war zone and possibly getting a limb blown off or worse die. Yeah I bet those medals really make the families of dead soldiers feel SOOOO much better. Medal for a leg? Anyone? But if you take the medal, they will cut your benefits. Fair is fair. These medals don’t come cheap from Chinese factories. Just another way to glorify mediocrity and keep the sheep happy by those who have the most to gain if the proles think they’re ‘more special’ than the other low lifes who can only express themselves with the help of firearms and a government who can tell them who to aim for. It is a comfort in their old age, to wear their medals once a year and march down main street behind a boy scout brass band. Waiting for the recall back to service in the defense of their nation, with combat donuts and coffee. #7, First of all you have to be a nitwit to talk about something you obviously know nothing about. Isn’t meritorious service its own altruistic reward? Different medals have different precedence. The warm-body medals are lower precedence than the important medals like the bronze star, Congressional Medal of Honor, or Purple Heart that you actually have to do something above the call of duty. I don’t think civilians should receive military medals like your article suggests. #7 You are a nitwit. If we had this 40 years ago, decorated soldier Al Gore would have been President, and the Canadians wouldn’t have a war to be giving out medals in. #11. “Isn’t meritorious service its own altruistic reward?” – a lot of military contractors and defense industry consultants are shaking their heads in disbelief. But really, Tim Hortons should have their own medal. Something donut shaped with peanut clusters.